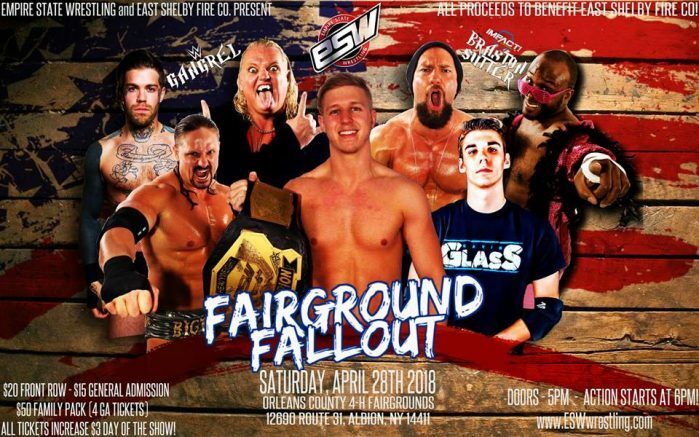 Empire State Wrestling (ESW) will debut at the Orleans County 4-H Fairgrounds, at 12690 Route 31, Albion, and present “Fairground Fallout” on Saturday, April 28. The event will feature former World Wrestling Entertainment superstars Gangrel and Colin Delaney, plus Impact Wrestling’s Braxton Sutter. Gangrel is best known for his tenure in World Wrestling Entertainment, which included being the leader of “The Brood” faction that also consisted of Edge and Christian. The trio were temporarily part of The Undertaker’s “Ministry of Darkness” group. He partnered with Matt and Jeff Hardy to form “The New Brood” as well. Sutter’s appearance at “Fairground Fallout” comes of the heels of nearly capturing the ESW Heavyweight Championship from Kevin Bennett. After the match, a very frustrated Sutter shockingly took his frustrations out physically on Bennett and threw a table and chair at ringside. Sutter is set to face Rochester’s “Captain” Nick Ando. Delaney has made numerous appearances with ESW over the last few years. At ESW’s last event, he and his partner Cheech challenged for the ESW Tag Team Champions against the reigning champions Oliver Street Express and The Fraternity in a triple threat match. Delaney will face ESW stalwart Brandon Thurston at the Albion event. Some of Western New York’s best independent wrestling talent will be showcased at the event. Fan favorite Frankie Feathers will battle against former Ring of Honor (ROH) star Cloudy. Ex-ESW Heavyweight Champion Bill Collier, Albion native Kevin Blackwood and Medina’s Gavin Glass will be in action. “Fairground Fallout” is being presented in conjunction with the East Shelby Fire Company. Proceeds from the event will benefit the fire department. Front row tickets are $20, while reserved tickets and general admission tickets are $15. Family packs consisting of four general admission tickets are $50. Ticket prices increase $3 at the door. Doors open at 5 p.m. and the action starts at 6 p.m.
ESW promotes eight shows a year, primarily held at the St. Johnsburg Fire Hall in North Tonawanda, boasting crowds of over 400 fans. Larger “super show” events have been held at the Kenan Center in Lockport and the Frontier Fire Hall in Niagara Falls, drawing crowds up to 1,000. For more information, please contact David Jarka at davidjarka@gmail.com. Be the first to comment on "Empire State Wrestling plans Albion event"